A classic downtown Vegas hotel reminiscent of San Francisco's early days with an excellent buffet, microbrewery, and nice rooms. Main Street Station is a solid 3-star budget hotel with very favorable reviews. 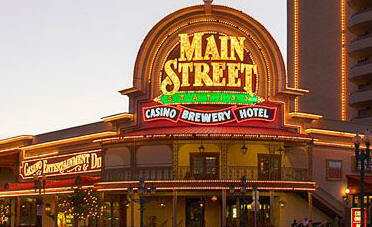 It is located a few steps away from the Fremont Street Experience in downtown Las Vegas. 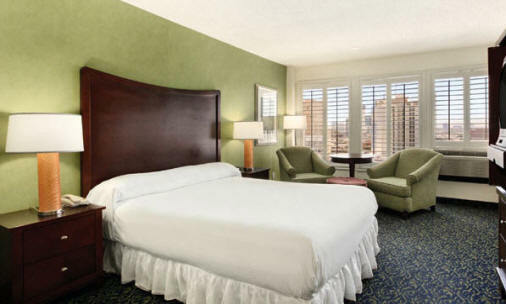 Staying here you are just minutes away from the Las Vegas Strip. The hotel prides itself on a collection of Victorian antiques including Buffalo Bill's dining car. Even the lobby and restaurants have a Victorian grandeur. There is a large excellent buffet with foods from around the world and a combination microbrewery and restaurant that has a limited but good tasting menu. Standard amenities including TV and hairdryers are to be found in the recently redecorated rooms. Rollaway Beds and Cribs Available, Handicap Accessible Rooms, Refrigerators Available for request for medical purposes, In-Room Safe, Free Wireless Internet available in Lobby, King or 2 Queen rooms available. Award winning microbrews featuring six varieties of the freshest hand-crafted beers in town, tasty appetizers, hand made pizza, gourmet burgers and sandwiches, steaks and ribs, and a fresh sushi bar. Triple 7 is a great place to watch your favorite sporting events while enjoying a great meal. Voted best buffet in Downtown Las Vegas with spacious surroundings and an elegant Victorian d�cor. Prices are a true bargain too. Open for breakfast, lunch and dinner. Offers a vast array of delicious choices including Mexican food, Southwestern fare, Asian delights, their famous rotisserie chicken and pizza. The Garden Court Buffet features specialty nights including T-Bone Tuesdays, Steak and Scampi Thursdays, Seafood night on Fridays and Prime Rib on Saturdays. A champagne brunch is served on Saturday and Sunday. The Victorian themed 28,000 square-foot casino has all the latest live action tables, and more than 800 of the latest video and reel machines. Don't forget to check out the Daily Slot Tournament. Main Street Station guests have the convenience of using the California Hotel's sparkling rooftop pool. Open mid-April to mid-September, weather permitting, hours are 8 am to 8 pm. Towel service is provided. The Fremont Street Experience is located in the heart of downtown near Main Street Station. This world-famous venue is home to Viva Vision, the largest LED screen in the world. Experience free concerts, special events, and roaming street performers throughout the year. The main center of the Las Vegas Strip and all it has to offer is about 4.5 miles away (10-15 minute drive). Two-Decker buses (The Deuce) run between downtown and the Strip 24/7. You can also purchase an unlimited riding pass. Taxis and regular public buses are also available. Casino: 28,826 square feet. Casino games include Blackjack, Craps, Keno, Roulette, Let it Ride, Progressive Pai Gow Poker, Score with Four, 900 slot machines (including nickel slots), 25 table games, Video Poker, Megabucks and Slot Tournaments. 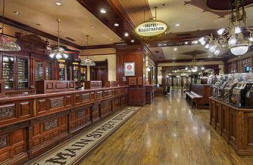 Restaurants: Main Street Station has the following dining options: Garden Court Buffet and Triple 7 BrewPub. Currency exchange, laundry service, luggage service, maid service, safety deposit box, valet parking and wake-up call. Air conditioning, alarm clock, remote-controlled cable TV, hair dryer, iron and ironing board, electronic door locks, in-room safe, pay-per-view movies, radio and telephone.